Beautiful spring flowers popping up. I had no idea what I was going to take a photo of today and to be honest I hadn’t even given it much thought. I walked outside at about 3.15pm saw my lovely neighbor staining a piece of wood and wandered over. I spotted her flowers in the background and there it was. Just being aware – that is what I love. I must admit, I had to dodge a fair amount of dog poop to get this shot. Beautiful! Ha – maybe you can get her a pooper scooper and just leave it by the front door some night. Really good composition Kenneth and the vignette or dodging really works to enhance the colours. Beaut shot. Thanks Glyn. Appreciate the comments. Looks like this lovely shot was worth the poop dodging! You mean fertilizer? Well worth it. They seem to be opening up to the sunshine and warmth of spring. I love that you can see into their very centers. Beautiful shot. 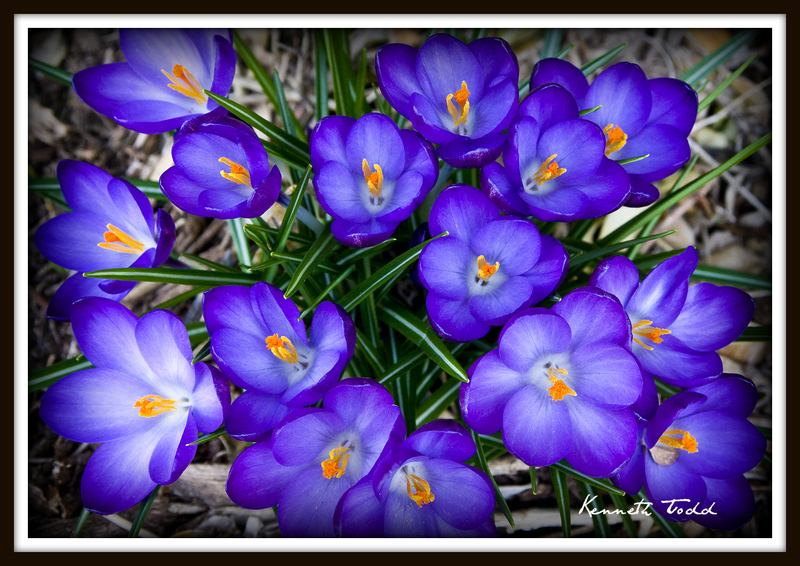 I had a crocus kind of photo day too. Spring flowers make this 365 thing so much easier! The colours just pop! Beautiful. Wow, this is so much better than the one I took. Looks like I need to get back out there and try it again. Just discovered your site since you “liked” mine. Your photography is spectacular. I’ll admit that I possess only minimal photo editing skills.